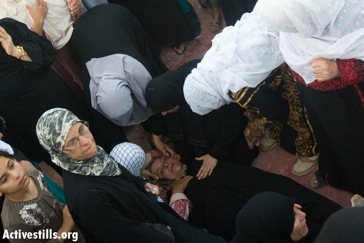 On the 4th of August Yusuf Ahmad Amira was buried in Ni’lin. 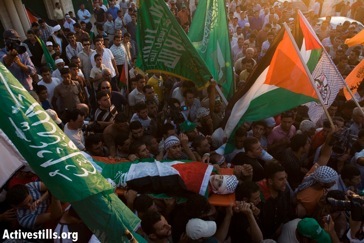 He was killed by Israeli soldiers, shot on 29th of July in Ni’lin after the funeral of Ahmed Mousa. The procession of the funeral was attacked by the army using tear gas, sound grenades and rubber bullets against the people who had come to pay their respects to Yusuf. The funeral gathered thousands of people. 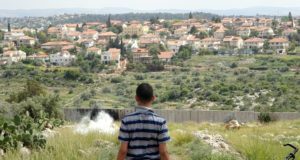 On 29th of July Yusuf Ahmad Amira was shot twice in the head at short distance by rubber-coated steel bullets by soldiers inside an Israeli military jeep. 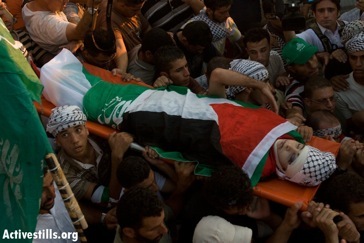 It was the same day as the ten-year-old boy Ahmad from Ni’lin was buried. Yusuf was declared brain-dead that night, but remained on a respirator for several days. On Monday 4th August he died. 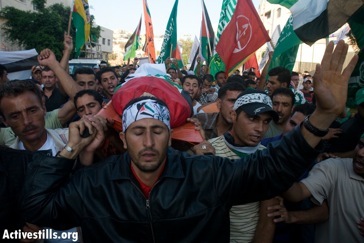 His body was taken from the Ramallah hospital in the afternoon and brought to Ni’lin to be buried. The caravan was stopped by Palestinian police that arrested eight people for carrying Hamas flags. They were soon released. 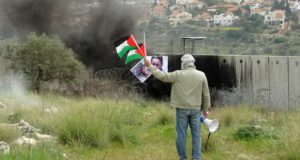 Once the caravan that consisted of about sixty cars reached the second checkpoint at the entrance of the village of Ni’lin the army attacked it with sound grenades, tear gas and rubber bullets. The army had also occupied a rooftop at the entrance of the village. The shooting caused panic as the crowd tried to avoid the attack and reach the village. 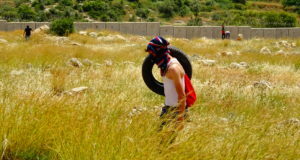 One man was hit in the head by tear-gas cannister and was taken to hospital in Ramallah. 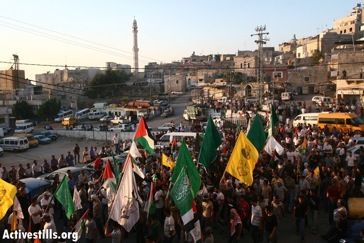 The funeral gathered thousands of people from Ni’lin and neighbouring villages. The body was carried to the family house on to the mosque and then to the graveyard where it was buried. Ni’lin has now lost two boys in less than a week due to Israeli military violence.